Jenn and Romy: Bristlecone Pines: Earth's Oldest Living Things! Whenever we make a trip over to the Bishop, CA area, we have to stop and see the Bristlecone Pine trees. They live happily in this one spot (although their range extends into Nevada and Utah), high up on the mountain tops in the White Mountain Range in east central California, just north of Death Valley National Park. The White Mountains are in the rain shadow of the Sierra Nevadas, so they are extremely dry and cold, but just as high! The tallest peak in the Sierra Nevadas (Mt. Whitney) stands at 14,525 ft, while the tallest peak in the White Mountains (White Mountain) stands at 14,246 ft.
Driving up to see the Bristlecone Pines over Thanksgiving 2009. 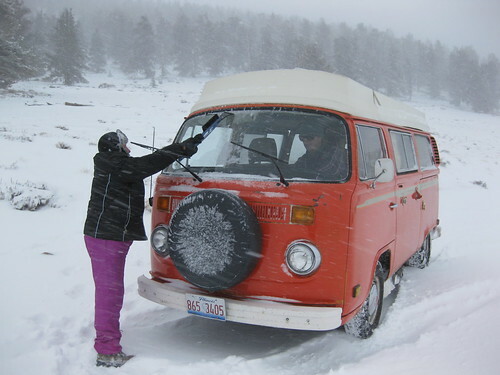 My mom is scrapping off the ice build-up on the windshield. The Bristlecone Pine forest is in the background. The Bristlecone Pines live up there, just below the tree line. They survive in the dry, windy, and cold environment because they grow very slowly and their wood is highly resistant to insects, fungi, and disease. 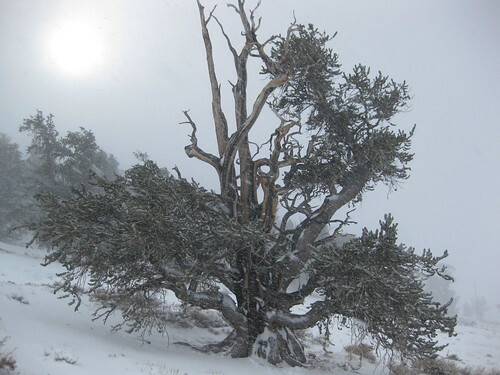 The oldest known tree living right now is 4,767 years old and is named "Methuselah." It grows somewhere up in the Ancient Bristlecone Pine Forest, a protected region up in the White Mountains. Its exact location is kept secret to protect it. To give you an idea of how old that actually is, Methuselah was a seedling when the ancient Egyptians began building pyramids. It is still alive today! A Bristlecone Pine in the White Mountains. The White Mountain Range is home to the oldest Bristlecone Pines. Scientists who read tree rings have made a continuous record of the pine trees' growth that goes back 10,000 years ago by coring dead trees and alive ones. This website is a great place to learn more about them! 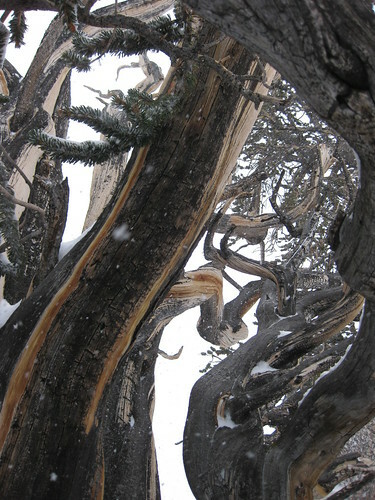 A close-up view of the twisted branches of a Bristlecone Pine in the White Mountains.